By the 1950s Margel Hinder had achieved a reputation as one of the most accomplished and committed of Australia's modern sculptors. Raised in America and familiar with European and American abstract developments before her arrival in Sydney in 1934, Hinder moved to the forefront of modernist activity in Sydney in the 1930s and 40s. Hinder worked in a variety of media including wood, metal and plastics and with a range of techniques, although she has consistently preferred carving. She was one of the few women artists in Australia who was involved in public commissions on a monumental scale. Hinder was concerned, not to relate her sculpture to nature or the figurative, but to resolve abstract conceptions and principles in three-dimensional forms, which could also give definition to her feelings. 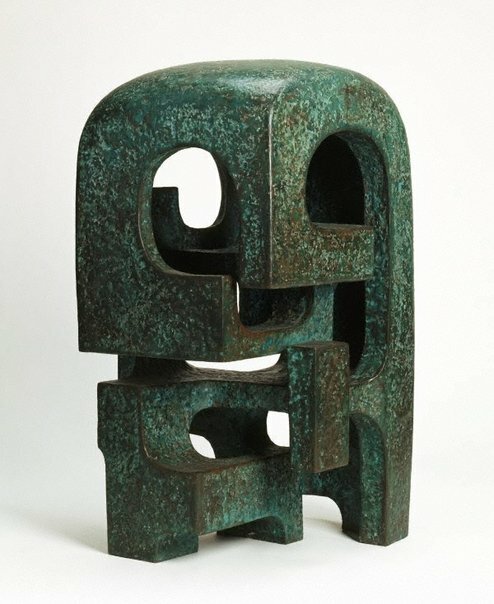 'Green garden sculpture', constructed by building up sections of copper sheets in overlapping thicknesses, is a finely resolved complex of interlocking forms and space. The sculpture of Margel Hinder , 'List of illustrations', pg. 6-7, Willoughby, 2013, 127, 130, 131 (colour illus. ), 155. AGNSW Collections , 'From Colonialism to late Modernism', pg. 7-106, Sydney, 1994, 75 (colour illus.). Natalie Wilson, Parallel visions: works from the Australian collection , 'Grace Crowley / Ralph Balson / Frank Hinder / Margel Hinder', pg. 88-103, Sydney, 2002, 102, 103 (colour illus. ), 144, 147.